Oakleaf is sponsoring KEMP Hospice’s 10th Midnight Walk – The Reunion 2017 on Saturday 17 June. 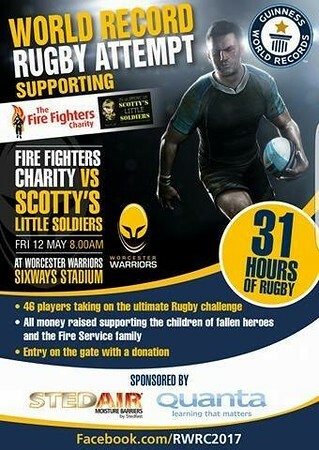 Oakleaf is proud to be sponsors of the team shirts in a World Record Rugby Attempt to be held at the Worcester Warriors ground in Worcester on Friday 12 and 13 May 2017. Oakleaf Commercial Services Development team received a Considerate Constructors Scheme Silver award for their Keats Place site in Kidderminster. Oakleaf Commercial Services has received a further Considerate Constructors Scheme National Site Award to add to their collection, for their Keats Place development in Kidderminster. The Community Housing Group has sponsored a number of prizes at an awards ceremony held last week at Kidderminster school, Baxter Business & Enterprise College. Staff from The Community Housing Group (TCHG) are supporting an appeal collection for the local Franche Community Church foodbank to help donate items to others over the Christmas period. Congratulations must go to Sara Cheung, Gas and Electrical Compliance Officer for the Oakleaf Energy team, for completing the final Wolf Run to become an Alpha Wolf. Congratulations to Claire Sawyer once more, for now becoming the first additional female member to join the Association of Gas Safety Managers (AGSM) Advisory Panel. A team from Oakleaf Grounds Services, along with housing and regeneration specialists, Keepmoat, joined forces to create an attractive seating area in the playground at Baxter College, Kidderminster.